Earlier this month, U.S. Congressman Joe Pitts (R-PA-16) held his 9th Annual Croquet Tournament at his home in Unionville, Pennsylvania. 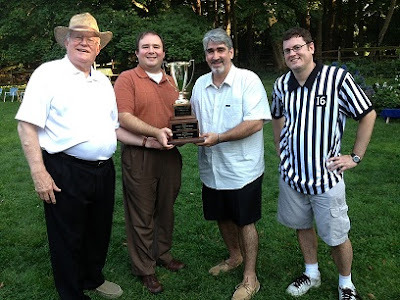 The tournament attracted multiple teams of players and after several hours of intense play, the team of PA State Representative John Lawrence and Genesis RVP Paul McGuire emerged victorious! Pictured is Chairman Pitts awarding the winning team their trophy. It is important to keep in contact with Members of Congress throughout the year. Please let Matt Smyth, Senior Director at AHCA/NCAL know about your meetings with federal legislators while they are home in the district: msmyth@ahca.org. Introducing AHCA/NCAL’s 2013 Group Volunteer of the Year, Helensview High School! Students at Helensview High School in Portland, OR. not only understand this adage, they live by it. Since 2009, Helensview, an engaging environment designed to help students with needs that have not been met in other educational settings, teamed with Porthaven Care Center, a 99-bed long term care and rehabilitation center, to create a volunteer program. Students in the volunteer program enjoy playing board games and making crafts with residents. Recently, the group proposed, developed, and implemented a special design area in the facility to display resident art projects. Many Porthaven residents and Helensview students have developed rewarding relationships and strong intergenerational bonds. Porthaven staff has noticed that Helensview students have assisted in improving resident behaviors, as well. Currently, the Helensview program has a lengthy student waiting list. Check out this great segment of our 2013 Developmental Disabilities Hero of the Year, Helen Cherry, speaking about her award! AHCA members and the advocacy team have been hard at work getting Members of Congress to tour facilities while Representatives and Senators are back in their states for the August Congressional recess. Most recently, Rep. Joe Courtney (D-Conn.) toured a Kindred Crossings West, a Skilled Nursing Center in New London, Connecticut. Carrying the day’s issue of the New London Day newspaper, in which AHCA placed an ad praising the representative for his support of long-term care issues, Courtney and his staff sat down for nearly an hour and a half with administrators and staff at the facility, as well as a few residents, to discuss a myriad of issues facing skilled nursing. Rep. Courtney is a steadfast proponent of expanding beneficiary access to Medicare and crafting a solution to the observation status issue. He is the cosponsor of H.R. 1179, the Improving Access to Medicare Coverage Act of 2013, introduced in March 2013, which seeks to eliminate the observation status barrier to Medicare access at SNFs. Courtney also recently spoke at the AHCA Congressional Briefing in June, providing members with valuable insight on how to effectively communicate LTC issues to Members of Congress and their staffs while on the Hill. Other congressional visits to AHCA facilities over the recess include the offices of Rep. Eric Cantor (R-Va.), Sen. Ben Cardin (D-Md. ), Sen. Mike Crapo (R-Idaho), and Sen. Debbie Stabenow (D-Mich.), among others. Congratulations to the 2013 Gold Quality Award Recipients! 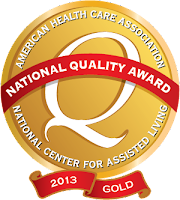 This year, AHCA/NCAL is celebrating five care centers that have earned the coveted Gold National Quality Award! The award is the final of three distinct awards possible through the National Quality Award program presented by AHCA/NCAL. The competitive award program highlights select facilities across the nation that serve as models of excellence in providing high-quality long term care. AHCA/NCAL shared the news in a press release on Monday. AHCA/NCAL previously announced the Bronze – Commitment to Quality and the Silver – Achievement in Quality recipients earlier this year. AHCA/NCAL will present the awards at the 64th Annual Convention & Expo in Phoenix, Ariz., on October 9. Please join us in congratulating these outstanding centers, their leadership and their staff! NBC Connecticut Highlights "Medicare Coverage Gap"
When Lee Barrows's husband needed nursing home care after a week-long hospital stay, she believed that the costs would be covered by Medicare. Traditionally, Medicare covers up to 100 days of nursing home care if a patient has spent three or more consecutive days as an admitted hospital patient. A few days later, a doctor told her, "I'm sorry Mrs. Barrows, but your husband was never admitted," forcing Lee to pay $30,000 out-of-pocket for her husband's nursing care. After filing multiple appeals with Medicare, she was eventually reimbursed. Introducing AHCA/NCAL's 2013 Young Adult Volunteer of the Year, Josh Sosebee! 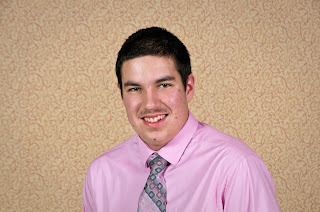 AHCA/NCAL applauds Josh Sosebee of East Ridge, Tennessee on his 2013 Young Adult Volunteer of the Year Award! Josh, age 16, has been a notable volunteer of Life Care Center of East Ridge, a 130-bed long term care facility, for the last four years. During his time at Life Care Center, Josh has cultivated strong relationships with residents, and has developed several programs to better address their needs. Josh created Canning for a Cause, a weekly canning program to can vegetables and other items to raise money for organizations that residents support. He also formulated a men’s discussion program and organizes activities like poker and model car events. Residents particularly enjoy helping with the local animal shelter’s adoption events through Josh’s Pet Adoption Program. Josh has impacted the volunteer pool at Life Care Center of East Ridge. Whenever the facility holds a special event, Josh brings a friend, and more often than not, those friends continue to volunteer. Josh’s dedication to serving others will be recognized at the AHCA/NCAL 64th Annual Convention & Expo in Phoenix, Arizona, on October 6-9, 2013. An estimated 53,000 centenarians are currently living in the United States. Fred Smith of Oklahoma is one of them. A lifetime Oklahoman, Smith recently celebrated his 102nd birthday. Up until last year, Smith was still living in his home and driving around town in his Oldsmobile Cutlass. Now a resident of Noble Health Center, Smith recently reflected back on his long life, and explained that love is what has, and will always pull him through. 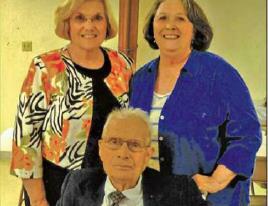 Smith loved his late wife, Lula, and enjoyed 67 years of marriage by her side. When she began suffering from a paralyzed state during her last three years, he enlisted continual home care. “That’s what love does,” Smith said. He served as a deacon for more than 70 years, held multiple jobs in farming, and was employed as a butcher at the University of Oklahoma in his later years where Smith estimates the college served 5,000 meals a day. “At age 65, [Smith] learned to water ski, got his real estate license and served as tax assessor for Marshall County, a position he had for 10 years,” explained a recent article from The Norman Transcript. Smith was also an avid gardener whose work had been featured in multiple magazines and television shows. In addition to his beloved late wife Lula, Smith has three children, four grandchildren and three great-grandchildren. “I hope I’ve taught them how to grow l-o-v-e and how to work,” Smith said. Check out the full story from The Norman Transcript here. 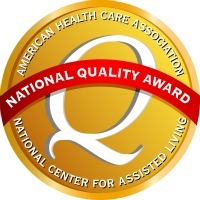 The AHCA/NCAL National Quality Award program is introducing a new recertification policy, effective for the 2014 award cycle, that impacts all current and previous AHCA/NCAL National Quality award recipients. Under this policy, Bronze and Silver Quality Award recipients will have a limited amount of time to apply for the next award level (Silver or Gold) before being designated as a “past recipient” of the award, a status that requires the facility to reapply at the Bronze level if it decides to participate in the program again. Currently, award recipients are not limited to the number of years they can promote their center as a Quality Award recipient. Centers are responsible for reading and complying with the recertification policy, which is available in full on the AHCA/NCAL National Quality Award website. In addition, there is a Frequently Asked Questions document to answer some of the common questions associated with the new policy. Please contact quality-award@ahca.org with questions about the new policy, a center’s current status, or general questions about the National Quality Award program. Introducing AHCA/NCAL's 2013 Adult Volunteer of the Year, Lorraine Oakes! AHCA/NCAL applauds Lorraine Oakes of South Mills, North Carolina on her 2013 Adult Volunteer of the Year Award! 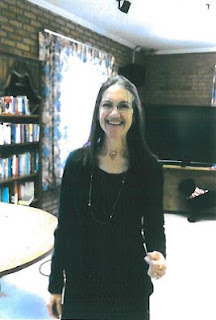 Ms. Oakes has been a celebrated volunteer of Kindred Healthcare, Elizabeth City, a short-term rehabilitative and long-term care facility, for the past 22 years. She enjoys sitting with residents and getting to know them each on a more personal level. Ms. Oakes has created and significantly impacted multiple programs at Kindred Healthcare, Elizabeth City. Fifteen years ago, Lorraine played a major part in developing the facility’s thriving dining assistance program. She also created a popular Bible Studies program. Ms. Oakes currently serves as the Volunteer Coach at Kindred Healthcare, Elizabeth City, and she advises all volunteers at the facility. She is also an active volunteer at local assisted living facilities and elementary schools. Ms. Oakes’ dedication to serving others will be recognized at the AHCA/NCAL 64th Annual Convention & Expo in Phoenix, Arizona, on October 6-9, 2013.